"The Chiltern Hills Enduro Club Lane End meeting for Novices/Practice Day on Sunday 21st March gave me the ideal formate to test my 2009 model KTM 250 EXC-F (4 stroke) after the guys at PDQ had breathed on my pride and joy by fitting a JD Jetting kit". "The problems I had with my bike was it was crap on a cold start, and with more races adopting a 'start from cold' policy, warming the bike before scrutineering was becoming a chore. There was the usual 4 stroke achilles heel a of a dip in the mid range, resulting in the bike bogging if you didn’t keep the revs up, especially on an incline. And last, but not least, a rather annoying habit of cutting out on an incline under a closed throttle". "Apart from the issue with the cold starting the other problems appear (at first glance) to be resolved. The bike accelerates much more crisply and having the steep inclines of Lane End to play on gave plenty of opportunity to test the fueling as I attempted climbs in a gear too high or had to stop mid-accent to let someone be extricated ahead of me. Nick at PDQ had attempted (with limited success) to adjust the carb needle settings to make the bike more rideable to save the cost of fitting the kit, but if a jobs worth doing its worth , well you know the rest. Anyway 3hrs dyno time and the kit supplied by them came in at £200. Nick now has a queue of punters waiting to see how I got on before they go ahead with the kits themselves and I doubt they’ll be disappointed. They may even become official JD importers if there’s enough interest and dyno time may come down as they become more familiar with the kits. So give them a ring, I can only speak as I find and I was impressed with their service and yes RBJ is trying to ponce a kit out of them, tight git (that's news to me! – RBJ). See you at the next CHEC event in April……. Tony"
As you can see from the Dyno chart above, the lower midrange has been massively filled out between six and seven thousand rpm. There is a small increase in top end power too, with the powere hanging in a little longer as well. But it's the 'rideability' that is what Tony was after, and it seems as this has been achieved. Unfortunately I wasn't able to ride it myself during the test, but i've no doubt I'll get a chance soon enough and we'll update this report during the year. For updates email me and I'll add you to the news group. On the strength of this test PDQ have now decided to keep these kits in stock and as Tony said, cost should come down. UPDATE July 2005 - PDQ's Latest Multi Dyno Complex now fully open! We are pleased to announce that our new purpose built 3-dyno complex is now completed and fully equipped to test and tune FOUR wheeled BIKE ENGINED vehicles of various shapes and sizes as well as motorcycles. PDQ have been dynoing & tuning bikes for over 15 years and were one of the first Dynojet motorcycle dyno centres in the UK. 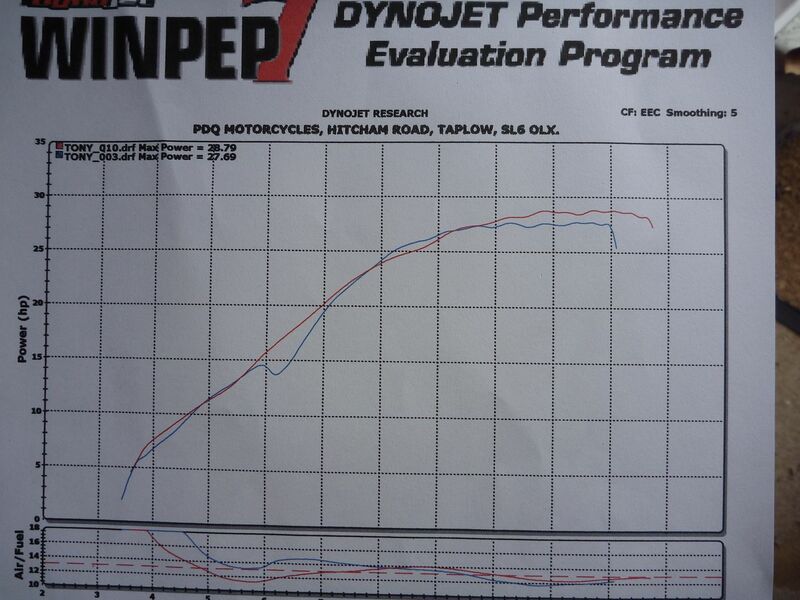 We are an authorised Dynojet Power Commander Tuning Centre and also a Yoshimura Performance Centre. 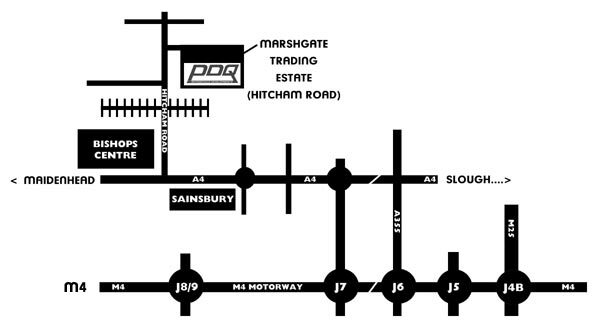 Directions from to PDQ from the M4 Motorway... Take exit J7 from the M4 (Slough West). At the roundabout turn LEFT onto the A4 towards Maidenhead. Go straight over the lights, straight over the mini-roundabout (with Sainsbury’s on the Left). Approx 150 yds on the right you will see a turning for HITCHAM ROAD. Take this turning, follow the road up and under the railway bridge. We are situated in the trading estate on your RIGHT as you come out from under the bridge. This is the MARSHGATE TRADING ESTATE.